These Crisps featured the optimum crunch. They were crisp and firm and the early bites cracked and broke, rather than mulched like autumn leaves underfoot. The crunch was also sustained for a good period, until they finally succumbed to the sad stage that Crisps always reach before their demise - the mush stage. As with most Handcooked Crisps, these were extra thickly cut. They also looked hard and firm, with oil blisters mostly intact. There was a generous coating of orangish brown seasoning powder to add to the anticipated hot and fiery experience that awaited. Jalapeno flavour Crisps rarely provide much in the way of Nose Plunge aroma, and these were no different - It was a mild peppery smell. 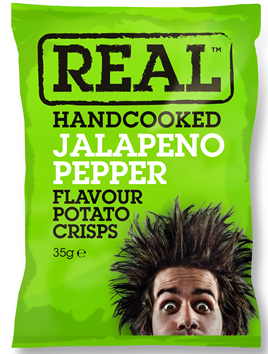 The flavour was not nearly as fiery as the man with hair sticking up on end was suggesting on the front of the bag, but these were Jalapeno flavoured Crisps not Jolokia Pepper. They were just about as spicy as they should be. A Crisps manufacturer has a tough decision when it comes to hot flavours - do they blow customers' heads off and deter them from purchasing again? These walked that narrow path between eye-watering to nicely munchable, with perfect confidence.